This pilot project explores the ideas developed in our proposal for the Digging Into Data 2011 competition. It uses a sample data set of 113 Weekly Address videos by President Obama (2009-2011). Digging into Global News collaborators studying a montage visualization of the data set. Visualizations: Jeremy Douglass and Tara Zepel. When Lev Manovich first theorized a framework for understanding “database cinema” a decade ago, similar research largely focused on analyzing new forms of avant-garde video art practices generated by creative professionals for gallery audiences. With the rise of “Web 2.0” technologies and user-generated content since the founding of YouTube in 2005, media studies scholarship came to emphasize the importance of “fan remix” and “citizen remix” in the domain of vernacular video. Often these amateur remixes were celebrated as examples of democratic leveling made possible by access to free or inexpensive tools for recording, editing, compositing, aggregating, and distributing digital video by those who followed the work of Henry Jenkins recognizing the cultural contributions of a broader “participatory culture” of non-professionals. Now that the remix aesthetic has been appropriated by traditional institutions once associated only with one-to-many mass media, new theories of remix are needed to explain contemporary advertising, government propaganda, and television news, because as Geert Lovink points out, remix and political activism do not necessarily go together. A series of President Obama's weekly video addresses. Each weekly address is depicted by a single representative image. With new developments in media studies and the digital humanities, the Software Studies Initiative at University of California, San Diego has grown to include research from each wave of scholarship. Current projects that incorporate media visualizations using digital images and video include work on art history (Lev Manovich), fan remixes (Eduardo Navas), video recordings that show how interactive media such as videogames (William Huber) or electronic literature (Jeremy Douglass) are structured, and public relations video from political advertising campaigns (Tara Zepel) and government agencies (Elizabeth Losh). Software Studies has also expanded its relationships with collection holders across the globe as it broadens to include more disciplines. In their new project, Digging into Global News, the group brings together many different domains of knowledge to examine how visual imagery reflects the rhetorics, aesthetics, and narratives of broadcast news, specifically in the case of political speeches that are remixed and interpreted by various international news sources. President Obama's 2009 Nowruz address to the Iranian people as excerpted by the TV news program Democracy Now! Each frame represents a sequential shot of the program. Shot 19 (third column, third row) is the excerpt from President Obama'a video address. President Obama's 2009 Nowruz address excerpted by Al Jazeera TV broadcast. Each frame represents a sequential shot of the program. Shots 5 and 6 (first row) are excerpts from President Obama's video address. Television news often serves as the first, most vivid draft of history and shapes the conventions of political speech and civic participation around the world, but undertaking systematic analysis of large digitized corpora of broadcast news video archives and even smaller corpora of government public information videos presents a number of technical, methodological, and institutional challenges to researchers working in the fields of rhetoric, film and media studies, journalism, history, civic education, informatics, and information design. Although a deeper understanding of news promises to improve public dialogue and education at all levels, video news broadcasts have been frequently dismissed by critics as less engaged in serious critical inquiry than newspaper journalism and – until relatively recently – perceived as ephemeral and difficult to cite as evidence. 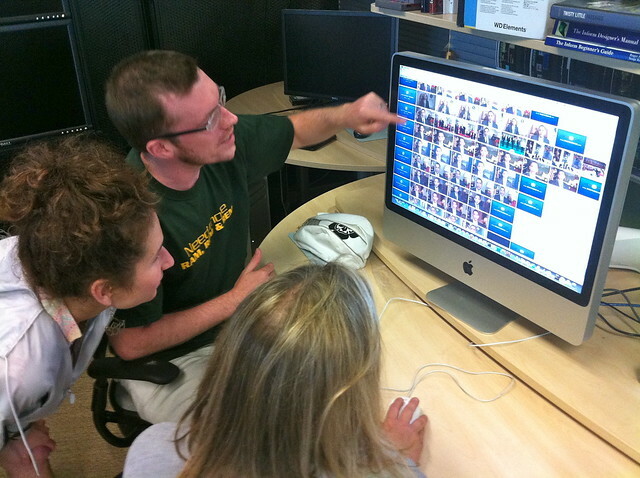 The Software Studies group is uniquely situated to develop visualization tools for news analysis, given the fact that a typical television news program is an example of “database cinema” that is composed of many different kinds of source footage, including studio shots of anchors, field reporting, stock footage used for B-roll, video news releases, government public relations materials, and witness journalism from cell phones and mobile devices. Source clips may not be attributed much less tagged with date, location, individuals shown, or information about the person or organization behind the camera. Furthermore, the meaning of objects or gestures in the frame -- even if they are identified -- as evidence of the intention or motivation of particular political actors, can be extremely controversial. 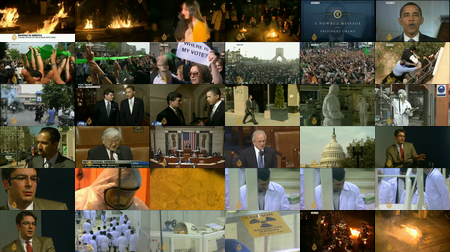 Montage of 113 Weekly Address videos by US President Barack Obama (2009-2011, left to right, top to bottom). Each video is represented by a single keyframe of the first full shot after the title and credit (generally the third shot). To explore the patterns in large sets of video, such as the sample set of this project, we use both existing free software and also custom code written to accomplish particular tasks. For example, the montage of frames representing the videos above was created using open source software ImageJ. To create a visualization which shows all shots in the videos (below), we fist used a free shot detection software to automatically find shot boundaries in all videos. The results were then imported into Excel using a custom UNIX script written for this project. The data was edited in Excel, and then visualized using another custom script. Close-up of the visualization of shots in 113 President Obama weekly video addresses. Full visualization appears below. Each video is represented by a horizontal bar, which contains a number of frames (one frame for every shot in the video). Videos are arranged chronologically from top to bottom (2009-2011). Data: 113 videos, 848 shots. First video: 1/24/2009. Last video: 4/6/2011. Videos range from 146 seconds to 477 seconds. Shots range from 1 sec. to 208 sec. Phase One of Digging into Global News focuses on a particular corpus of digital video that is frequently remixed into global news broadcasts. Because it is easily accessible in HD format and clearly identified as free of copyright restrictions, the online archive of video addresses featuring U.S. President Barack Obama posted on the White House website has appeared in news coverage from CNN, the BBC, Al Jazeera, and many other large broadcasters around the globe, as well as in “independent” or “alternative” media sources that produce news programs, such as Democracy Now! Obviously the same footage may be incorporated, interpreted, and contextualized differently, based on the editorial interests of the station, which provides a rich resource for considering how primary sources are presented to the public. Media created by a sitting U.S. president is always historically significant. In addition to research done by historians, political scientists, communication scholars, and rhetoricians, Barack Obama has also generated significant scholarly attention worldwide from those who study American popular culture, race relations, religion, gender, class, civic participation, digital culture, and globalization. The volume of scholarly publication of peer-reviewed books and articles about Obama and the large number of conferences, panels, and talks reflect the potential importance of this collection to scholarly discourse. President Obama’s style of seated direct address to online audiences has also established the conventions of a particular genre of political speech that has been adopted by other heads of state and political figures. an empty cell indicates that this object did not appear. (Tags assigned by E. Losh). Each video is represented by a bar. Videos are organized left to right by date. Each row shows the appearances of a particular type of object in the video set. If an object is present, the cell is filled with blue color; an empty cell indicates that this object did not appear. Each video is represented by a bar. Videos are organized left to right by date. 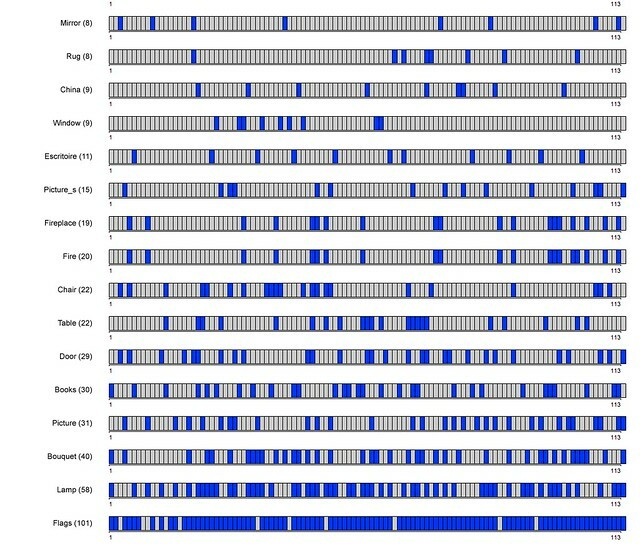 Each row shows the appearances of a subject in the video set. If the subject is present, the cell is filled with red color; an empty cell indicates that this object did not appear. (Subject tags: www.whitehouse.gov/briefing-room/weekly-address). Each video is represented by a keyframe superimposed over a x,y coordinate point. X-axis = video release dates (2009 - middle of 2011). 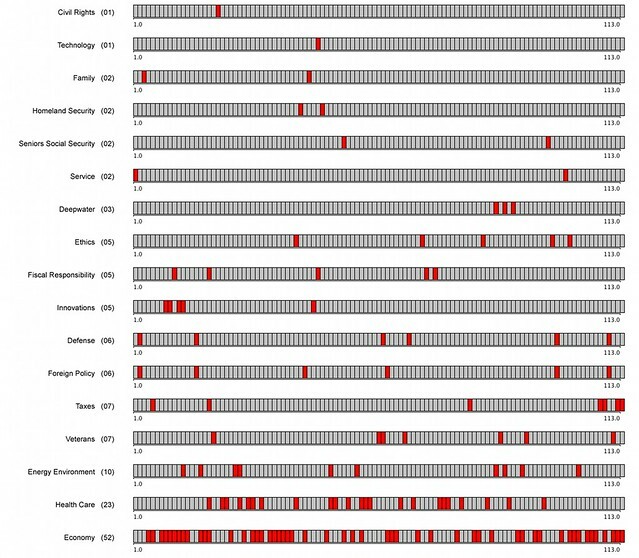 This corpus also has a number of technical advantages for media visualization because it generally features a single seated figure (Obama) with frequently recurring and easily identifiable backgrounds (rooms in the White House) that are shot with a fixed camera and usually edited in a very simple style with only four to five cuts. Outliers and trends often stand out in this collection in striking ways, and its limited variability facilitates a number of interesting research questions about genre. Our initial research with the President Obama videos focuses on analyzing the videos by duration, date, political issue, geographical staging, commodities and technologies displayed, gesture and facial expression in the oratorical performance, and aesthetic decisions about cinematography and editing. The work is part of a larger proposed collaboration between Software Studies Initiative at University of California, San Diego, the researchers at the University of Amsterdam and the Netherlands Institute for Sound and Vision, and collaborators from University of California, Irvine, the Internet Archive, and Al Jazeera TV. Moeed Ahmad - Al Jazeera, head of New Media. Collaborator. Jonathan Alexander - University of California, Irvine. Professor of English. Irvine, CA. Collaborator. Martijn Kleppe - Erasmus University, Rotterdam. Researcher at Erasmus School of History, Culture and Communication. Rotterdam, Netherlands. Collaborator. Falko Kuester - University of California, San Diego. Calit2 Professor of Visualization and Virtual Reality. San Diego, USA. Collaborator. Elizabeth Losh - University of California, San Diego. Director of Academic Programs, Sixth College, Program in Culture, Art, and Technology. San Diego, USA. Lev Manovich - University of California, San Diego. Professor in the Visual Arts Department. University of California, San Diego, USA. George Oates - Internet Archive. San Francisco, USA. Collaborator. Johan Oomen - Netherlands Institute for Sound and Vision (Nederlands Instituut voor Beeld en Geluid), Research and Development. Hilversum, Netherlands. Cees Snoek - University of Amsterdam. Researcher at Intelligent Systems Lab. Amsterdam, Netherlands.